We’re here in the press room at Google I/O for the follow-up press event to the Google Wave unveiling today during the keynote. 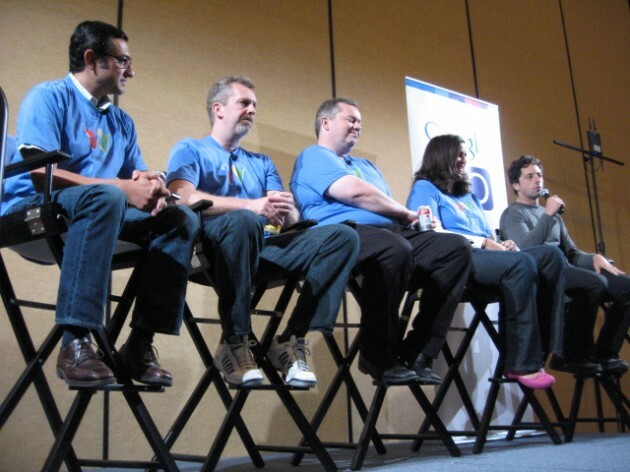 The initial audience response to Google Wave was huge; there was a standing ovation the likes of which I haven’t seen at a tech event, including the Apple events in recent years. We spoke with the creators of the service, brothers Lars and Jens Rasmussen and Stephanie Hannon yesterday, but it should be interesting to see and hear from them following the initial reception. Find our live notes below and the live Qik stream below that. The creators are here along with Vic Gundotra, Google’s VP of Engineering. Vic: Google wants to move the web forward. Greater of the usage leads to more Google Search ultimately. Google Wave is exciting for open source and it’s running in the browser. This could be a turning point on the web. Q: This does Gmail and Google Docs one better. Will Wave be the evolution of both or a replacement? Vic: This is an early developer release of our Wave, but we’ll see this over several products/services/sites. Q: Limitations of the mobile site of Wave? Lars: This is just the developer preview again, mobile isn’t finished yet. But because we built it in the web browser, it can be on many of the smart phones that use the rich mobile web browsers. If we did native code, we’d have to write it multiple times, but with the web we write it once. The web by far is the best choice for us. Eventually access to the camera and other advanced features will be available through the browser. Q: This seems like this will replace email –but can it really replace all we love about email? Lars: We think of email as an incredibly successful protocol. Google Wave is our suggestion for how this could work better. You can certainly store your own copy by way of the APIs and with the extensions. The model for ownership — it’s a shared object, so how do you delete the object? Even though it’s a shared object, no one can take it away from you without your consent. There will eventually be reversion to sync up with the cloud or you own servers. We’re not planning on having spam in wave (laughs). Early on in email, spam wasn’t really taken into account, so we benefit from that learning experience. We’re planning on a feature so that you can’t add me to your Wave without being on a white list. Q: Is this something that forces identity on people? Will there be anonymous usage? Lars: I don’t think Wave will answer that question way or another. With our APIs people can make the choice of how they use it. If a person embeds a Wave in their own website, it’s up to the website who can interact with that Wave. You can use anonymous comments, or a number of different identities. Q: You haven’t talked about advertising. Ideas for that? Lars: We haven’t talked about it because we haven’t thought about it — yet. That’s a benefit of working at Google, we have time to think about how to make money from this. It’s the same way we worked with Google Maps, the ads eventually came. Q: No immediate need for this replace email — so how can this be all in one? Lars: Integration with Twitter is an example of what you can easily build with the APIs. You can do that for email too if it’s open on their end. Imagine if someone has an email extension that will turn all your emails into a Wave — and replies come back via email. It’s not simple, but it could work. Q: How do you integrate with Gmail or other Google services? Lars: Again, it’s very early for us. When you sign up for Google Wave, it’s your Google account, you’ll have your Google Contacts, etc. Q: Is this Google’s attempt to organize the world’s communication? Who is or will be your competitor? Lars: Acme Wave (the fake demo they used) is the competitor (laughs). Look, I don’t know. It’s not something we really thought about — it was all about making communication and collaboration better. There’s a lot of overlap with web services that makes it hard to figure out which service to use at which time. Stephanie: It’s important to know that we’re going to let people build their own Wave services. It’s not about us controlling this. 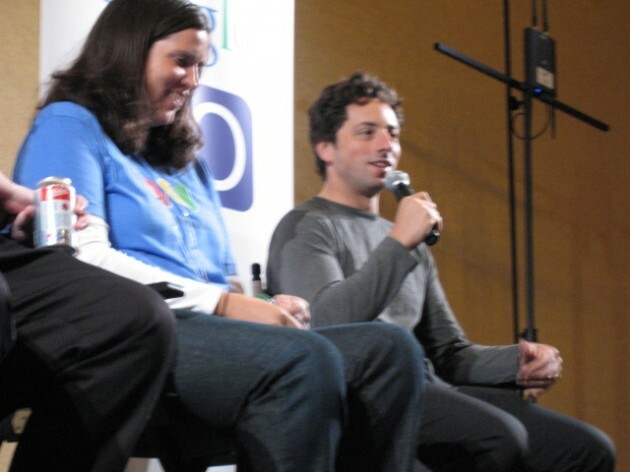 Here’s Sergey Brin, Google co-founder. Q: Lots of ways to market this. How do you do it? Vic: Really haven’t thought about that too much. Q: Top 3 priorities for developers, that you’re doing core work in? Lars: Doing our absolute best to make the developers happy. We’re looking for the 3,000 early adopter developers who are adventurous. Sergey: And you’ll be working on scalability right? Stephanie: And we’re excited to learn from users. Q: Who would this be the most useful for? Vic: The way a lot of social sites work today is that you get sent a link via email when someone updates something. With Wave it can all be done in the system. That’s just one example. Any social company can use it too. Q: How interoperable will it be — how open source? Lars: The developers can choose completely. We’re using the most liberal license to open source our code. Q: To Sergey – Lars came to you with this idea in 2007, why go with it? Sergey: It did sound kind of crazy – we’re just going to reinvent communication (laughs). It was not a very compelling proposal, but Lars and Jens had reinvented what mapping was like on the web. So if it was someone else this might be different, but they have the body of work to give them the benefit of the doubt. 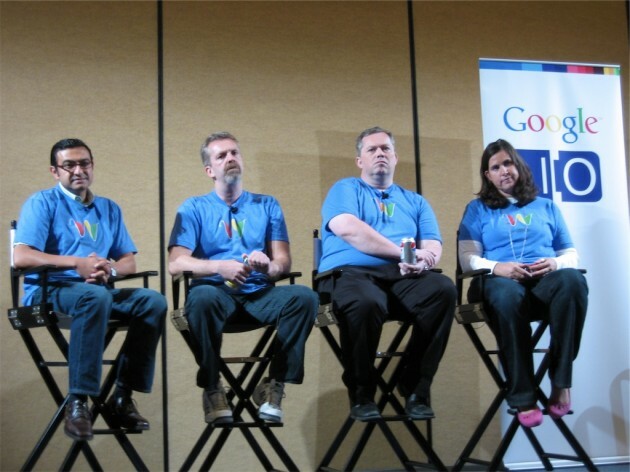 It was also an interesting experiment, it was one of the most independent groups that we’ve had at Google. Q: Google has reinvented how I do school work — where could this go for education? Lars: It could be a great tool for researchers, and students too. Vic: We very much care about your (student) demographic. Q: Why do this now? You’re trying to replace email, why will it work? Is this a SharePoint competitor? Vic: SharePoint is easy — this has far greater breadth. And it’s open and has a federation model. The previous day we talked about the five capabilities of HTML 5, so that’s why now. The main browsers are starting to support it. Sergey: Google Maps was on the edge of browser capability when we launched. Today, Wave is that edge. You’ll see a form of interaction with this you wouldn’t have before. Q: A lot made of real-time search and a lot of talk about Twitter — does Google put these real-time capabilities in perspective. Real time search? Lars: The liveness in Wave came about because we became obsessed with how fast you could see a message on someone else’s screen. With IM you’ve been waiting for someone typing, so we removed that (others have before). When it’s not live, you lose your attention on a conversation, but when you see it live, you’re engaged. From that a whole new set of use-cases came up. The live search aspect is fun. Q: Were there platforms that influenced you on this? After Maps and Wave, what’s next? Lars: Before we joined Google we (him and Jens) had the discussion about what would be next. Basically we realized email was like snail mail on the web, computers were evolving. We needed something faster. And IM and email shouldn’t really be two separate tools. We took inspiration from everything that we could see in communication and collaboration. Stephanie: We want to work on this for a while. Q: What did you show Sergey to sell him on it? Sergey: Nothing (laughs). It really wasn’t much besides the pitch. Demos came after we were already well brought in. We can’t have everyone at Google do these crazy ideas, but with a handful of past successes, that sold me. Lars: My vision is to have the one communication tool. I want all the use cases to be covered. We made up ideas of what Wave could be used for — negotiating contracts, writing articles. Lots of things. Stephanie: Each person you show it to seems to pick out other things they would use it for. Going back to email now, I miss the liveness. Q: How important of a roll is mobile going to play? And will Google ever release an official app for any mobile platform? Lars: Mobile is hugely important. If you’re out walking and and take a picture to put in a Wave, that’s perfect for mobile. We have no plans to make native apps for any mobile platform. The rate of progress on mobile is astounding — we hope soon access to the camera will appear. Maybe we’ll make a lightweight app just to get access to those if they don’t come quickly. Vic: You might have missed the Android and the iPhone working in the demo, but it worked great using the same code. It’s an economic issues as well. Think of those teams who have to write native code for all these platforms, but this is just one browser-based version. Q: Will this work right now on mobile? Vic: We’re not sure it’s ready yet, but we’ll let you know. We’re working on it. Some of it is just the layout. Q: Are you going to rely on grassroots adoption? Or will you work with the other big players to get them to adopt? Lars: This is just the first step today, but my colleagues are reaching out to friends to gauge interest. Q: Looking at the notification speed — is it too distracting? Stephanie: We’re still trying to figure out how best to handle the speed at which we can communicate. For example, the real liveness of real-time search could be distracting. We’re thinking about it. Q: Can you elaborate on the offline capabilities? Lars: Offline is very important, we don’t have support yet, but the protocols are designed for that. If you lose an Internet connection, you should be able to keep working. Full offline support will come later, but it’s coming.